Kukryniks’s painting “The End” was written in 1947-1948 and is considered to be the highest achievement in painting by a famous creative team whose art developed extensively during the Soviet era, starting from a political poster and ending with genre works. 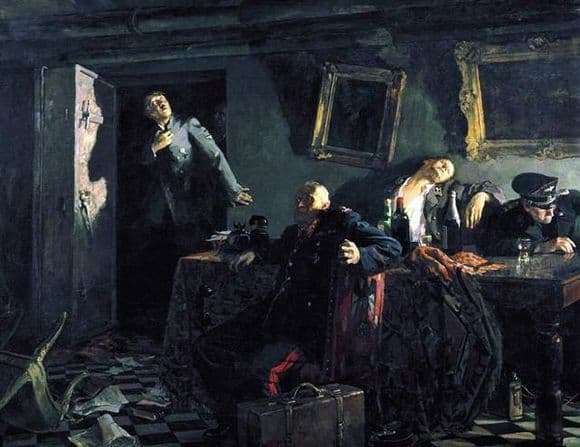 Kupriyanov, Krylov and Sokolov – three “pillars” and the founder of Kukryniksy – talked a lot about the creation of this picture, constantly mentioning their desire to capture the “collapse of fascism”, and the artists, perhaps, coped with their task completely. The almost square canvas, to the left of the center, depicts the leader of fascist Germany, Adolf Hitler, whose facial expression and posture betray the fear and despair of the tyrant. He is standing in the doorway, his head thrown back comically, and trying helplessly to keep a calm expression on his face, although he is about to suffocate with excitement. Interestingly, the feature of Kukryniks is their mastery of caricature, which is clearly visible in the work on such a terrible topic as fascism. As a result, Hitler turns out to be tragicomic to the limit, along with the rest of the movement heads who are sitting at the table and do not even look at each other. The picture makes a strong impression even on the viewer who is new to her theme and the characters depicted in the story. The tension is created due to the format that “collects” the figures very closely, expertly worked out light and shade and thick color. Light falls from an unspecified source, from somewhere on the right, where the window where the main character is most likely located is located. The painful light snatches the faces of Hitler and his minions, emphasizing and not allowing them to hide. Kukryniks was able to capture what many artists of their time were afraid to depict, and they did it with impressive power.